A new study by an international team of scientists reveals the exact timing of the onset of the modern monsoon pattern in the Maldives 12.9 million years ago, and its connection to past climate changes and coral reefs in the region. The analysis of sediment cores provides direct physical evidence of the environmental conditions that sparked the monsoon conditions that exist today around the low-lying island nation and the Indian subcontinent. In Nov. 2015, University of Miami (UM) Rosenstiel School of Marine and Atmospheric Science geoscientist Gregor Eberli, along with his co-chief scientist Christian Betzler and an international team of 31 scientists from 15 countries, embarked on an eight-week expedition to the Maldives aboard the research vessel JOIDES Resolution. 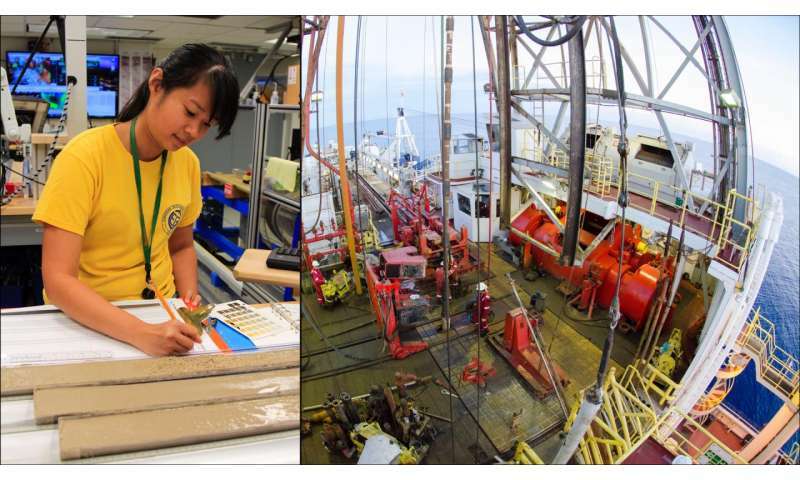 The scientific team on International Ocean Discovery Program (IODP) Expedition 359, which included UM geochemist Peter Swart and sedimentologist Anna Ling, extracted 3,097 meters of sediment cores that contain the history of the monsoon that is the most intense annually recurring climatic element on Earth. The monsoon system supplies moisture to the Indian subcontinent, which is important for the human population and vegetation in the region, as well as marine ecosystem in the surrounding seas. The Maldives are a string of island atolls built on coral reefs located in the middle of the Indian Ocean. The waters around the low-lying archipelago has steadily risen and fallen for millions of years in sync with the changing climate. A new climatic phase heightened by human influence has these waters rising again, endangering the existence of the popular island paradise. "They are at the center of the storm for sea-level rise," said UM Rosenstiel School Professor Gregor Eberli, a senior author on the study published in Scientific Reports. The low-lying island nation offers the scientists a unique opportunity to reconstruct climate conditions during previous periods of varying sea levels to help scientists better understand how future climate change will the effect the 1,000 km-long archipelago and low-lying coastal areas all around the world. Today, the monsoon winds bring moisture to the Indian subcontinent but also drive the ocean currents across the Maldives. These currents carry sediment to the Maldives that is deposited along their shores and between the atolls. These sediments hold historic records of climate change and monsoon activity during the last 15 million years. At the same time, these same sediments also bury ancient reef buildups that flourished before the monsoon started. These reefs hold the key to the sea-level changes that took place before the onset of the monsoon. Most scientists agree that the South Asian Monsoon is linked to the initial uplift, or birth of the Himalayas, but the timing and other environmental drivers at play are still in question. During Expedition 359, Eberli's team drilled seven holes along the Maldives Archipelago to collect sediments that hold records of past sea level and environmental changes during the Neogene, a geological time period that began 23 million years ago. The information can help pinpoint the timing and environmental conditions that supported the development of the modern day ocean currents and monsoon conditions. "We have unraveled the physical evidence of the monsoon and now know the exact timing of when the modern monsoon pattern began, and have shown what consequences the onset of the monsoon had on the coral reefs of the Maldives," says Christian Beztler, Co-Chief Scientist for Expedition 359, from the CEN at University of Hamburg in Germany. "The scientific results of this expedition will give answers to many fundamental questions of the monsoon and the climate in general." In the Maldives, the monsoon and sea level have an intimate history. During what geoscientists called the Miocene Climate Optimum, roughly 15 million years ago when temperatures and CO2 levels were higher than today, the reefs around the Maldives atolls were flourishing. When the climate began to cool and sea levels dropped, the atolls become exposed, only to be flooded again during the subsequent rise. However, with the onset of the monsoon the new ocean circulations patterns began to emerge that were not favorable to the islands' coral reefs. The team found evidence for a period of global cooling that preceded the onset of the monsoon. During this cooling period the atmospheric circulation began producing seasonally wind changes that were ripe for the development of a winter and summer monsoon. These winds also started to generate ocean currents, which in combination with the expansion of an oxygen minimum zone caused several of the atolls to be submerged. This global cooling led to an expansion of the West Antarctic Ice Sheet that caused global sea level to fall exposing many of the Maldives' reefs. The currents also caused local upwelling that was again detrimental to the corals. At three of the eight drill sites, these drowned reefs were found covered by current deposits. "These atolls basically drowned, which opened seaways across the Maldives that increased the monsoon activity," said Eberli. "This partial drowning of the atolls is very interesting as it shows that the combination of rising sea level and ocean current can be detrimental to coral growth." Upwelling of nutrient-rich waters and the strengthening of the currents sweeping over the reef flats were detrimental to the islands' coral reef foundation. Eberli suggests that the abrupt development of the modern-day monsoon conditions were not only due to the uplift of the Himalayas, which is a pre-requisite, but ultimately the result of the cooling after the Miocene Climate Optimum, which initiated the formation of the bipolar ocean circulation that is still in existence today. The study, titled "The abrupt onset of the modern South Asian Monsoon winds" was published in the July 20th issue in the journal Scientific Reports.